"No, mom, come on! Why do you have to go? You should have asked me first to see if I wanted you there!" This was the response I got from my 12 year old when I told him his grandfather and I would be going to the September 11th presentation at his school on Thursday. And let me tell you, that was an arrow through my heart. When did I become such an embarrassment to my child? This is my son who clung to me at drop-off in preschool and kindergarten AND continued to have separation anxiety throughout elementary school. Now, he doesn't even want me at a school function. Let me just say that the only reason I am going to this event is because my father is retired FDNY and is, therefore, personally connected to the loss of First Responders of 9-11. He was invited to attend by the gentleman who organized the dedication, a police officer who was at the Twin Towers on that dreaded day and who also lost a son who was a firefighter when the Towers collapsed. 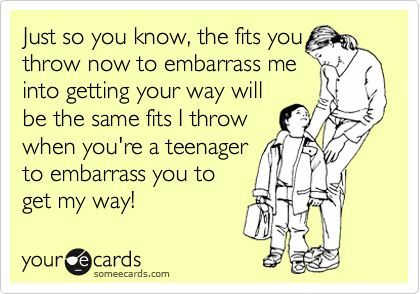 So, you see, I'm not going there to embarrass my son. I'd be taking my dad regardless of where the event was being held. It just so happens to be at my son's school. I told my son he doesn't have to acknowledge me or tell anyone I'm his mother - GOD FORBID. I also pointed out that there would be ZERO interaction as we'd just be seated inconspicuously in the audience. My husband and I have certainly known that there would come a time when our children no longer thought we were cool and didn't want us to be around. I guess that time has come - a little sooner than I expected it would. Gone are the days when my children ask me fifteen times if I'm going to a school event, just to make sure I'll be there. Parents are required to volunteer at my sons' school, so I already asked both of them if I could sign up to volunteer at their Thanksgiving luncheon. To no surprise, the older one said "NO WAY!" but the younger one said, "Yes, mom! Of course." However, with Thanksgiving still two months away, I guess there is still time for him to realize I'm not cool, too, and change his mind!